Naturally Chic has been on Instagram now for exactly one year! 2015 has been an interesting time learning about Instagram’s hashtags and curating my “grid”. Instagram has been challenging in many ways. Trying to figure out what photos to post and how to gain “likes” and “followers” isn’t easy. I don’t even have it half figured out yet, but I’m grateful to all those that have liked, commented or followed me at instagram.com/naturallychicweddings in 2015! I’ve finally learned to like Instagram and have enjoyed following many great accounts and seeing so much inspiration daily! Here’s Naturally Chic’s Top Instagram posts of 2015! 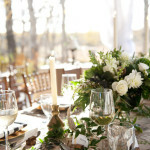 All weddings and inspirational shoots were planned and designed by Naturally Chic. 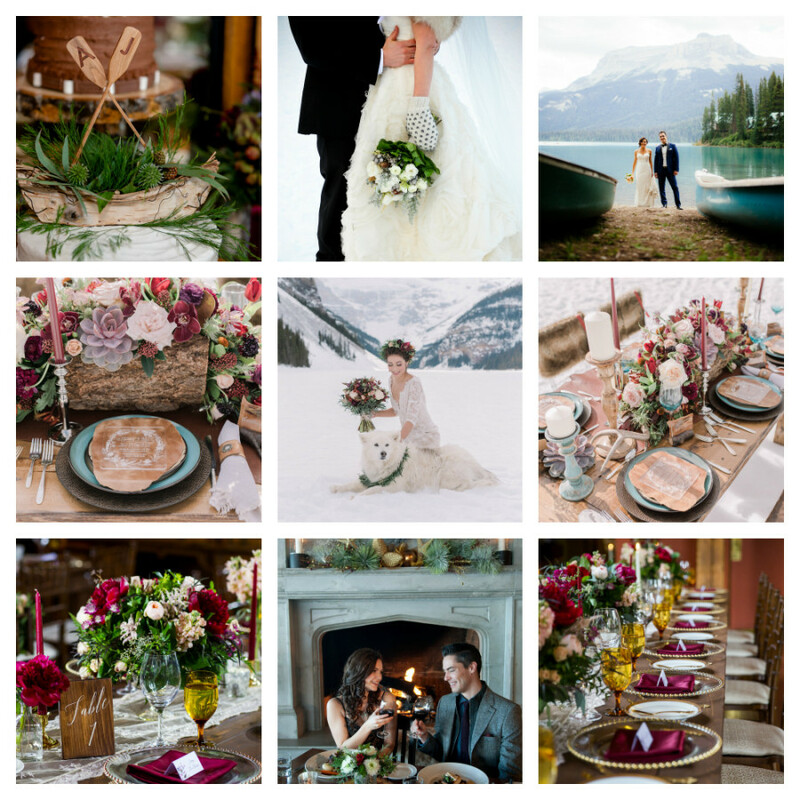 For information on planning your Canadian Rocky Mountain wedding, call Naturally Chic at 1.888.679.9056 or email us at hello@naturallychic.ca. Every year I like to do some kind of holiday post. This year, I came up with the idea of Christmas Eve Traditions for couples. I think it’s really meaningful for couples to take time out of their busy schedules to reconnect as a couple over the busy holiday season. 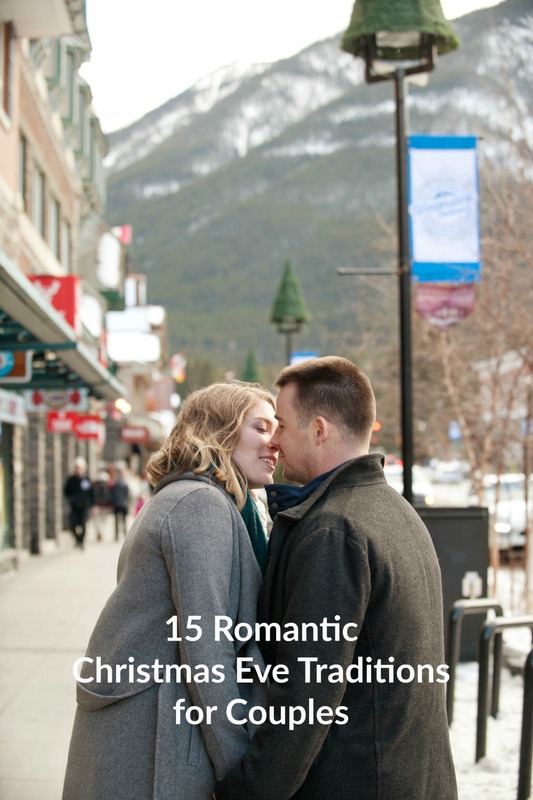 Incorporating special traditions that you do together as a couple is a great way to not only spend this Christmas but to also carry out for many Christmases to come. I came up with 15 ideas for couples, but there are so many other ideas to try! It’s all about finding ones, that work for you as a couple! This year, I approached Canadian Rocky Mountain Resorts about shooting this feature at their amazing Calgary venue, The Lake House. It’s a lovely, contemporary restaurant, with great food and a modern, rustic vibe (which I love!). I’ve been patiently waiting for my opportunity to plan a wedding there and doing a shoot there is an absolute treat for me! We were also lucky enough to spend time at CRMR’s quintessential mountain lodge in Banff, Buffalo Mountain Lodge. I enlisted the help of Tara Whittaker Photography, to photograph the inspirations I envisioned for this shoot. Together we asked a few friends to model for the shoot. After that, it was coming up with a pictorial representation of the traditions I envisioned. With the help of Adorn Boutique and Ed Williams Menswear, we were able to outfit our models and the plan came to life on our collaboration! 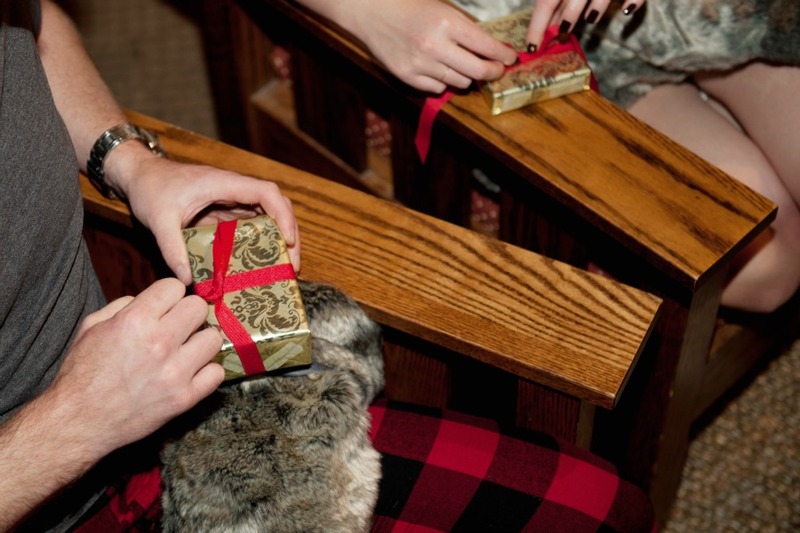 You can read all about this Holiday Inspired Shoot on my sister blog, Canadian Mountain Chic. Here today is a wrap up of the full feature on CMC. The CMC feature is loaded with ideas and inspiration and is featured in three parts: Part 1, Part 2 and Part 3. Be sure to check it out too! Share a Holiday Cocktail at your favorite lounge to kick off your evening. Our couple chose the Bar C Restaurant and Lounge on 17th Avenue in Calgary. 2. Dinner for Two While dinner at home together is wonderful, a night out together is really special! 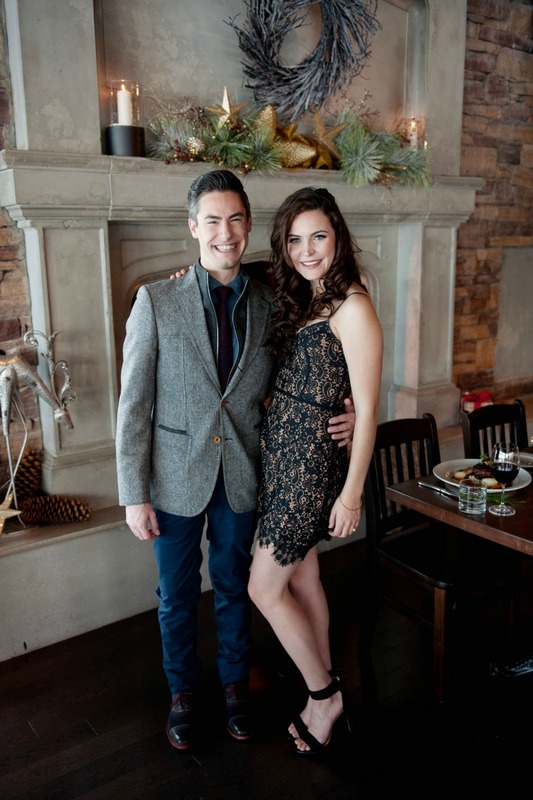 Our couple went to the beautiful, contemporary restaurant, The Lake House in Calgary’s southeast. 3. Exchange a Small Gift. As children, Christmas is full of anticipation and wonder, bring out your inner child and exchange a small gift on Christmas Eve. 4. Go Skating Outdoors. Any outdoor activity in the snow would be fun (building a snowman, skiing etc. ), but skating on a frozen pond at Christmastime is really romantic. 5. A Romantic Sleigh Ride. What could be romantic on Christmas Eve than a horse-drawn sleigh ride through a wintry landscape? Banff Trail Riders at the Warner Stables in Banff will take you on a sleigh ride through breathtaking scenery, and they’ll even stop for hot chocolate and smores! 6. 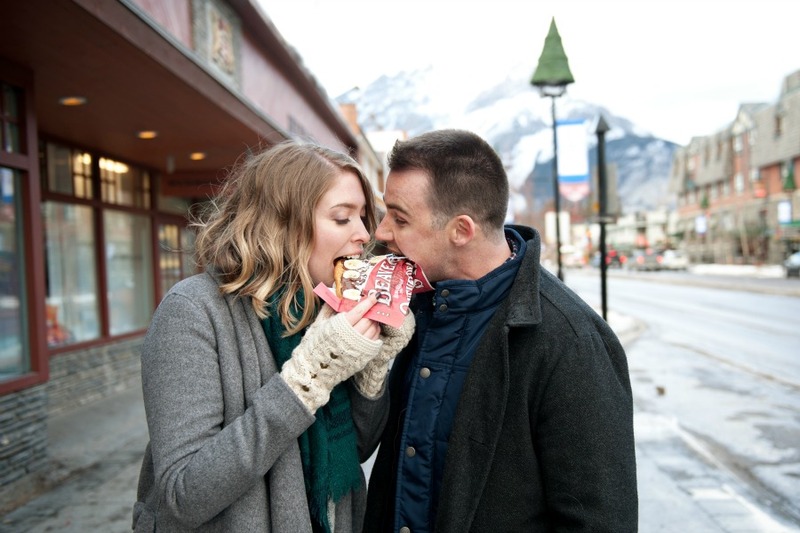 Go Window Shopping Together in Banff. The mountain town of Banff is a great place to not only spend your holidays but to also go window shopping for the day. The streets are lined with iconic Canadian brand stores such as Roots, The Hudson Bay, Beaver Tails and more, and is also full of unique shops, candy stores, and fudgeries! 7. Choose a Christmas Ornament Together. Each year, choose a special ornament that in some way represents your year together, or is meaningful to you in some way. Over the years you’ll amass your own special collection of ornaments to treasure and perhaps pass on to your own children one day! 8. Mountain Getaway for Romance! Escaping to the mountains is always a good idea! Spend your Christmas at a romantic mountain lodge. You can board all day and then curl up under the mistletoe later on! 9. Dinner for Two at a Cozy Mountain Lodge. Skip the holiday preparation and fuss, and have your holiday dinner served up for two. All you have to do is sit back, enjoy and toast the season together! 10. Watch a Holiday Movie together. Relax and enjoy a stress-free evening watching one of your favorite holiday flicks! 11. Love Letters Wine Box. This is such a romantic holiday tradition to start! You simply write a note to your partner telling them how special they are and what they mean to you! 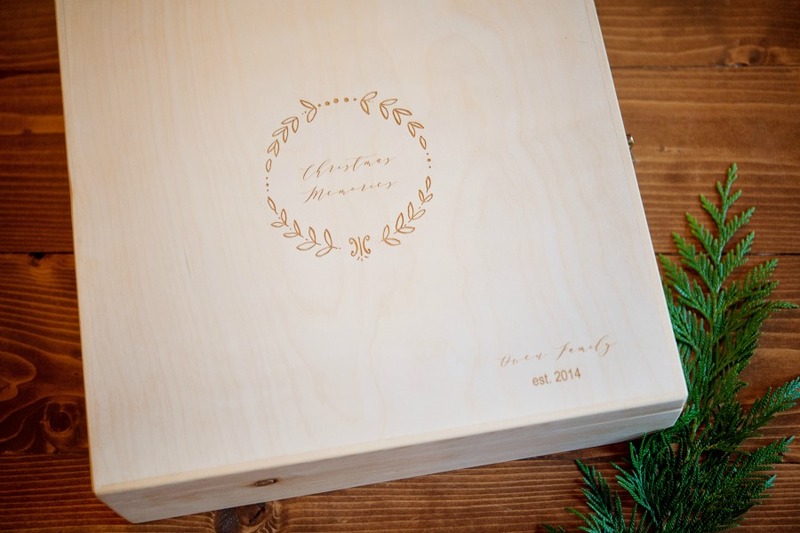 A fun twist is to seal your love letters in a wood box with a bottle of wine. Then, you take the letters out and read them on the following Christmas over a bottle of bubbly. It’s a great way to reminisce the year that was and to express your heartfelt appreciation for one another! 12. Exchange a Holiday Stocking. Items don’t have to be expensive! Have fun filling a stocking for each other and then opening all the little treasures the night before Christmas! 13. Enjoy the Holiday Light Displays together! Whether you walk through your neighborhood or explore the city lights, enjoying the holiday lights is a great tradition to revel in the beauty of the season. 14. Enjoy a Special Holiday Presentation together such as the Nutcracker. What could be more Christmasey! 15. Take a Holiday selfie every year (and make it into an ornament to hang it on the tree) to commemorate your Christmases together. Thank you so much for stopping by! 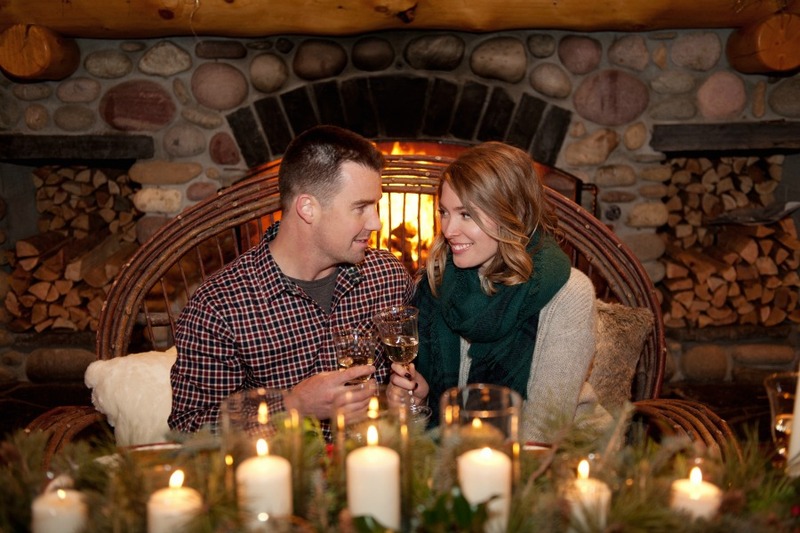 We hope you enjoyed our version of Christmas Eve Traditions for Couples! We’d love to hear from you! Do you have a special holiday tradition? Shoot Concept Idea & Design: Naturally Chic; Photographer: Tara Whittaker Photography; Designer + Stylist: Naturally Chic teamed up with CRMR and their properties The Lake House, and Bar C Restaurant and Lounge, along with Adorn Boutique (ladies fashion) and Ed Williams Menswear (gentleman’s fashion) for this inspirational shoot. With Flower Arrangement provided by Flowers by Janie; Hair and Makeup Artist: Brooke from Diva Salon Spa , Wood slice: Naturally Chic, Models: Shannon & Tyler, and a special thank you to Pamela Bigg and Lauren Webb from CRMR! Tablescape Design + Styling: Naturally Chic ; Photography + Styling (stockings): Tara Whittaker Photography;Venue: CRMR, Buffalo Mountain Lodge; Ladies Fashion: Adorn Boutique; Hair and Makeup: Mountain Beauties (MUA Nadine and Hair Stylist Suzanne); Wood Signage + boxes: Naturally Chic; Models: Kari (owner of Adorn Boutique) and Derek Owen. Men’s Pajamas: Roots. 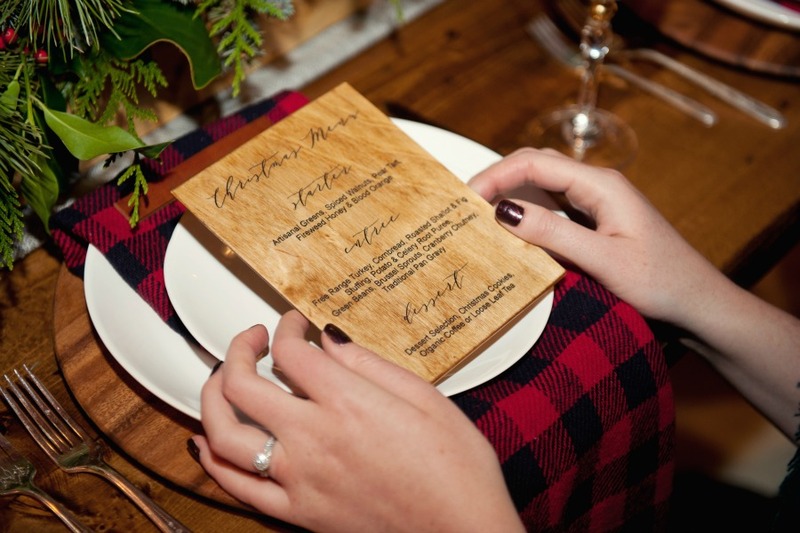 Wood menu: Naturally Chic; Wood Chargers: Celebration Creation; Floral Centrepiece: Naturally Chic; Buffalo Plaid Napkins (tea towels): Roots; Table Runner: Roots. Special Thank you to Lauren, Kerri, and Bree from CRMR! Happy Camper sweatshirt and mug by Camp Brand Goods, Fiasco Drinking Chocolate, Fiasco Coconut Marshmallows available at The Livery Shop. Luggage tag by Fairgoods , Passport holder by Yor Leather available at The Uncommons. Mrs tee custom design by Adorn Boutique. Razor & Shaving mug Kent of Inglewood. Macarons by Yann Haute Patisserie. Mini Champagne: Kensington Wine Market. Bow tie by LVJ Haberdasher, available at Kent of Inglewood. Carry-on Cocktail Kit by W&P Design, available at The Uncommons. Wool Socks, Peppermint Patties, Maple Mint Tin, Maple Syrup: Roots. ban.do iPhone cover and ban.do ear buds available at Adorn Boutique. Kate Spade gold and white striped travel mug available at Adorn Boutique. Free People socks available at Adorn Boutique. Kate Spade Notebook available at Indigo. Faux Fur Stocking available at Indigo. Stanley Flask available at Restoration Hardware. In honor of the Mad Men finale, I thought I would re-share some photos of a styled table shoot I did for the Vintage Wedding Showcase a couple of seasons ago. 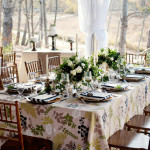 I was one of several participants who had to design a tablescape based on a vintage theme. I chose Mad Men, though I had never actually watched a Mad Men episode previous to the challenge. The first thing I did was get myself caught up in several seasons of Mad Men. Then, I immersed myself into the art and design of the late 50’s and early 60’s (the Mad Men era I chose to recreate for my tablescape). I actually found myself loving mid-century design and this Mad Men table design was an incredibly fun challenge from the usual mountain weddings I design! Here’s a few photos of my design captured by Tara Whittaker Photography and flowers by the talented Sarah Mayerson Design. Let me know what you think! Did I capture the era and would it make our beloved Don Draper proud? Thank you Mad Men for the extremely compelling entertainment! 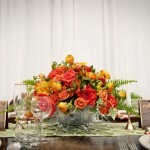 The flowers were oh so lovely and complemented the mid-century color palette! I made the table menus and drink menus out wood. We even made the table for the shoot! I chose lots of bright colors for the table including a popular color palette of avocado green and orange, which was extremely common in home decor in the mid-century. I also chose mid-century stemware and chose to put the flowers in a cut crystal bowl, which incidentally was a popular wedding gift at the time! I used real walnut and made the place holders look like the name plates commonly seen on every ad exec.’s desk in the mid-60’s! My wedding favors were an updated version of what was actually common to give as favors at weddings – personalized matches! And one of the most popular toys from the era was the slinky, so I had to have this beautiful item on my table for decoration! I designed a bar cart filled with items to make the popular cocktails of the day! Thanks for stopping by and Happy Planning! 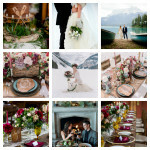 Be sure to check out our website at www.naturallychic.ca for planning your Banff Wedding in the Canadian Rocky Mountains. 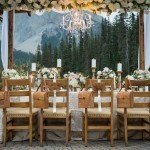 Are you planning a marriage proposal in the Canadian Rocky Mountains to your special someone? The Canadian Rocky Mountains boast some of the most beautiful places on earth and a romantic getaway can be a special start to the perfect proposal. Whether you’re planning on proposing at the top of the Gondola in Banff, while on a hike in Jasper, or enjoying breathtaking views at Lake Louise, the Rockies offer plenty of inspiring locations. Proposing is a daunting proposition and it’s natural that you’ll want to do it right. You may be feeling nervous and not sure where to start, but the one thing you know is that you’ve found that special someone to share your life with. Have the ring. When you have the ring it’s a clear indication that you are fully committed to spending your life together. Create an intimate atmosphere. Although there are no shortage of public proposals these days, we think a private or semi-private proposal is seriously romantic. Make it unique. Your proposal should be reflective of your relationship together. You don’t want to copy a proposal you saw on You Tube. It should be a good “fit” for the two of you, but that’s not to say it can’t be fun! Think outside the box. Whether it’s a simple idea or completely elaborate, the key is not to be mundane; it’s supposed to be special! Think a picnic set out in front of a glacial lake, a helicopter ride to a mountain peak with a panoramic view; the options are endless! Incorporate special moments or details into your proposal. You know your partner better than anyone; show her by remembering special details like her favorite wine or flower. A little something unexpected never hurts either! The key to a great proposal, especially keeping it a surprise, lies in the planning. Planning your marriage proposal may seem counter-intuitive to a sincere proposal, but really it’s the preparation that will make it go off without a hitch. It also allows you to be really thoughtful and creative! 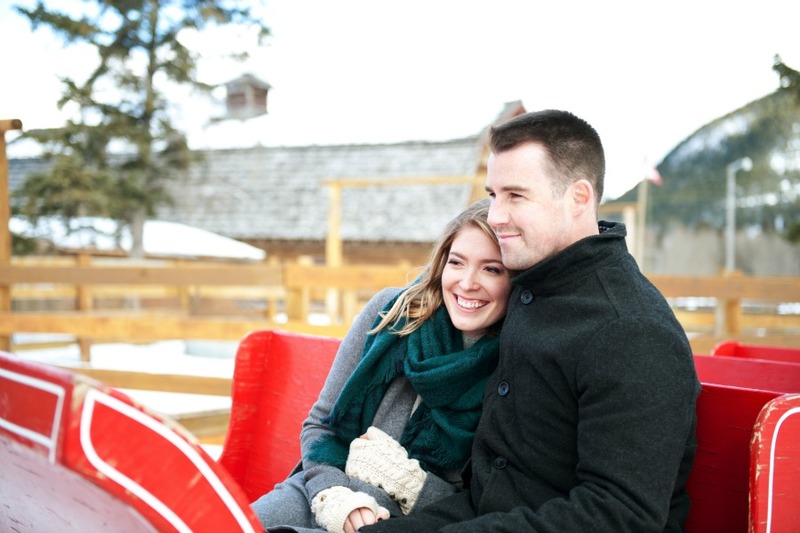 If you are looking for help planning your marriage proposal in the Canadian Rocky Mountains we’re here to help! We have proposal services that include a proposal concept only, or full plan and execution of the logistics and details of your proposal. All you have to do is propose! 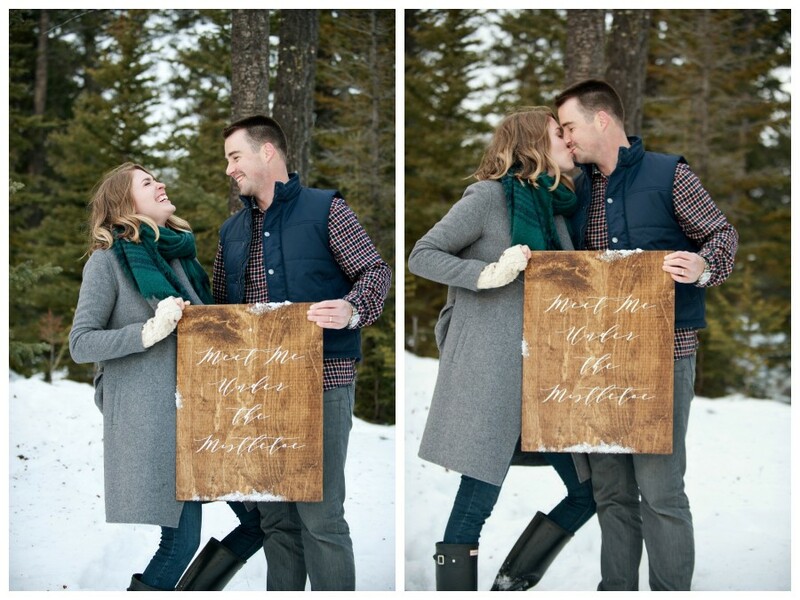 For more information on planning your marriage proposal in the Canadian Rocky Mountains, contact Naturally Chic at proposals@naturallychic.ca or call us at 1.888.679.9056! You can submit your proposal (once photographed) to our sister site Canadian Mountain Chic.